This is the third part of the Geometer’s Sketchpad Essentials Series. In this tutorial, we are going to construct the incircle of a triangle. In doing so, we are going to learn how to use the Compass tool and construct Angle bisectors. 1.) 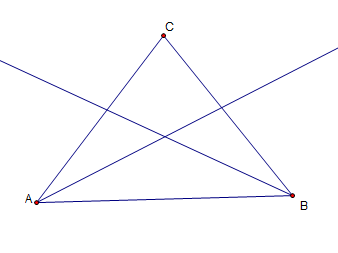 Using the Segment tool, construct a triangle. 2.) Select the Text tool and click each vertex to reveal their names. GSP will name the triangle ABC. 3.) To construct the angle bisector of angle A, deselect all the objects, and then click the vertices in the following order: B, A, C (or C, A, B). 4.) Next, click the Construct menu from the menu bar and choose Angle Bisector. This will produce a ray bisecting angle A. Now, construct the the angle bisector for angle B.